Borkerud farm on the St. Olav Ways in the Gudbrandsdalen valley. Experience Norwegian culture, learn about Nordic history, and take part in a European tradition. Regardless of your spirituality, a pilgrimage is a journey in more than one sense. The St. Olav Ways – the pilgrim paths to Trondheim – consist of eight pilgrim routes, all leading to the Nidaros Cathedral in Trondheim. The routes make up a total of around 3,000 kilometres of tranquil scenery through picturesque villages with a strong cultural heritage. Read more about the pilgrim paths to Trondheim. Plan your Norwegian pilgrimage yourself, ask a travel expert to help you, or join a guided group hike. Long distance hiking is not the same as just … walking. You hike for several hours each day, and after some time, you fall into your own rhythm. The repetitive pulse of your steps or your hiking pole frees up space in your mind for the big questions: the meaning of life, the mystery of suffering, the love for your family and friends – and also for that annoying old commercial jingle or children’s song you thought you had forgotten about. But now it’s on repeat. You will find pilgrim paths all over the country. Most popular are the eight St. Olav Ways which all lead to the Nidaros Cathedral in Trondheim, where Saint Olav’s shrine has been the most important pilgrimage site in the Nordic countries since the former Viking king Olav II Haraldsson was canonized in 1031. The eight paths to the shrine make up a total of about 3,000 kilometres of tranquil scenery and picturesque villages with a strong cultural heritage and delicious local food. 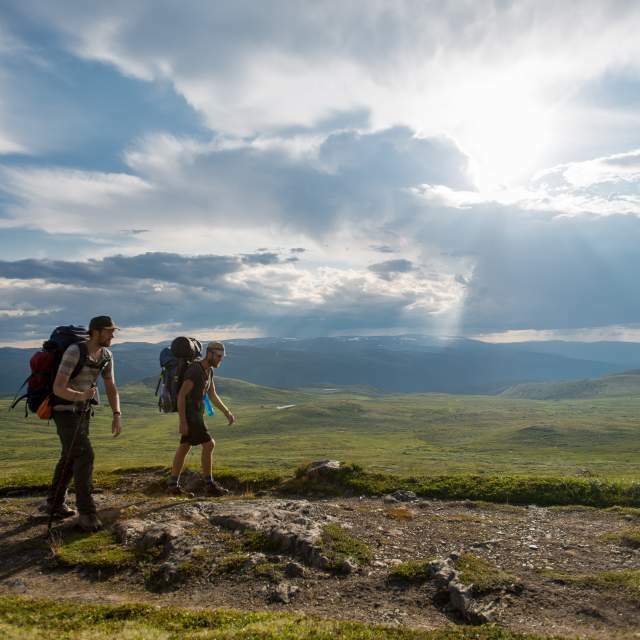 Most pilgrims choose the beautiful Gudbrandsdalen path, which spans 643 kilometres from the capital of Oslo to Norway’s third largest city, Trondheim. The route is the longest pilgrim path in the country and was the main road to Nidaros (now Trondheim) during the Middle Ages. You need at least 32 days to hike the path. On your way, you’ll walk past historical and cultural landmarks, through cultural landscapes and untouched nature, and into farms from the middle ages that offer culinary experiences based on seasonal ingredients from the district and a comfortable bed for the night. Whilst a pilgrimage is traditionally religious in nature – most pilgrims embarked on a pilgrimage to get either healing from sickness or pain, or remission of sins – the routes are now open to everyone, and the reasons for hiking are highly individual. Some see it as an educational tour, others simply want to take the time to reflect on life in a peaceful setting. Most modern pilgrims do however describe the journey as a deeply personal experience. What drives three blokes to take off on an adventurous wild camping pilgrimage? If you plan to complete your pilgrimage on high spirits and belief alone, you will probably struggle. But fear not – many places along the pilgrim routes are ready to cover your needs for a good rest, a proper meal, and a hot shower at a reasonable price. Sleep anywhere from open shelters and unattended cabins with self-catering and your own sleeping bag, to hostels and hotels that serve gourmet food. On the Gudbrandsdalen path, you should stop at Sygard Grytting. Visiting this farm and Historic Hotel is like going back in time, and the family that has run the place for the last 700 years treats hungry pilgrims to meat and fish from nearby forests and mountains, homemade bread and cakes, and marmalade made with berries from the garden. The farm also offers accommodation, both on the historic site and in the pilgrim hostel. Your last chance to spend the night indoors before you start on the ascent to the Dovrefjell mountain range is the medieval pilgrim farm Budsjord. For dinner, you can try the local moose taco, or you can just stop for a beer from the local brewery Hubertus. But these are just two of hundreds of places you can stop for a meal and a bed. Find detailed information and plan your overnight stays on pilegrimsleden.no. Sygard Grytting treats hungry pilgrims to meat and fish from nearby forests and mountains, homemade bread and cakes, and marmalade made with berries from the garden. Peek into the pilgrim farm Budsjord in the Gudbrandsdalen valley, where you can follow in the footsteps of medieval pilgrims – and try local moose tacos. Hiking the St. Olav Ways. Hamar Cathedral at Domkirkeodden in Hamar. Lunch at The medieval pilgrim farm Budsjord in the…. Pilgrims at the St. Olav Ways. Saint Olav’s holy shrine in the Nidaros Cathedral in Trondheim has been an important pilgrimage site ever since the former Viking king Olaf II was canonised in 1031, and it is still a treasured destination for pilgrims from all over the world. The site that started as a simple wooden chapel over the saint’s grave evolved over time into a magnificent cathedral. Nidarosdomen has since been the traditional location for the coronation of the Norwegian monarchs and is considered Norway’s national sanctuary. Not so strange, then, that the sight that met the pilgrims in Trondheim was and still is overwhelming: the Nidaros Cathedral is one of Norway’s most impressive buildings, filled with elaborate artworks and ornamented stone sculptures. Before you enter as a pilgrim, you should perform the old ritual of walking around the cathedral three times. You don’t have to be a thru-hiker to travel on foot in Norway. Whether you’re a beginner or an experienced trekker, you’ll find the perfect terrain for you. Put on your hiking boots and try on one of these five lesser-known hikes. Along the way, you get to enjoy the Norwegian nature whilst avoiding the crowds.